Working with word families is an effective way to get your students reading. It also helps them learn to decode longer words. Learning about the different word families is a fundamental part of reading instruction. It is important to draw students’ attention to the familiar chunk in words because they are representations of patterns that we use in our everyday language. When our students become proficient in the single syllable words, they will also become proficient in decoding longer words. 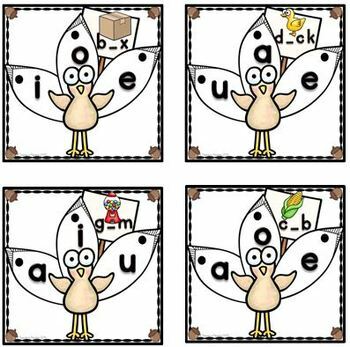 Here is an interactive, simple, self-checking way for your students to practice and strengthen their short vowel skills. There are two activities included in this 62 card packet. 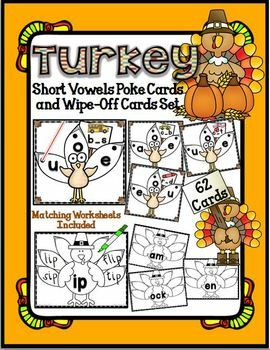 Students will use dry erase markers to write short vowel words on the feathers of the turkey; there are a total of 22 cards in this set and a matching worksheet for each vowel family. 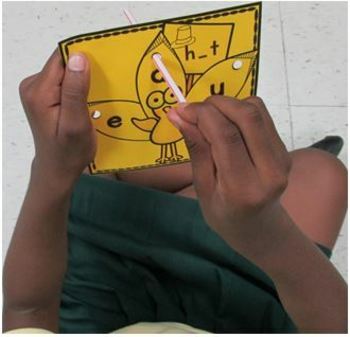 For the next activity, students will identify the vowel sound for the given picture and word by “poking a pencil or straw” through the hole by the correct answer. They will then turn the card over to check their answer; 42 cards are included in this set. (Directions are included.) If you are familiar with the Hot Dots system, this activity would work perfectly. Students are always excited to use this activity! Please download the preview to see some of the cards included in the set. The cards all feature turkeys for your Thanksgiving/Fall centers.